Hi everyone! As promised in my last post, I have more of the STELLA CHROMA holiday releases for you today! This is the Nutcracker Trio consisting of 3 beautiful flakie and shimmer filled polishes. Pam, the lady behind STELLA CHROMA has always loved the Nutcracker so what better theme for some holiday polishes? This trio consists of two softer colours and a fun bright all with a mix of flakes and shimmer. So let's get to it! Herr Drosselmeier is a 'pale grey crelly packed with red-orange-yellow iridescent flakies and red-gold shimmer'. This is Pam's favourite of the trio and I think it might be mine too. I used 3 thin coats, no topcoat. The formula was perfect and no issues whatsoever to report. This polish reminds of a fire opal. I love how the warm-toned flakies and shimmer pop and glow against the cool-toned base colour. So pretty! Sugarplum Fairy is a 'delicate, pale lavender crelly with red-green-purple iridescent flakies and green-yellow shimmer'. I used 3 thin coats. I feel this one pulls more light gray than lavender on me but you can still see it in certain lights. It reminds me of an opal. I think this will be a new go-to 'neutral' colour for me. It is so pretty and delicate. It makes me think of fairies and all things whimsical. Mother Ginger is a 'bright blue jelly polish with red-orange-blue iridescent flakies and green-yellow shimmer'. I used 3 thin coats. I love that Pam decided to include a bright shade in this trio along with the two soft shades. It has all the goodness of the flakes and shimmer but in a fun, vibrant colour! Pam does blue polishes so well and this is no exception. 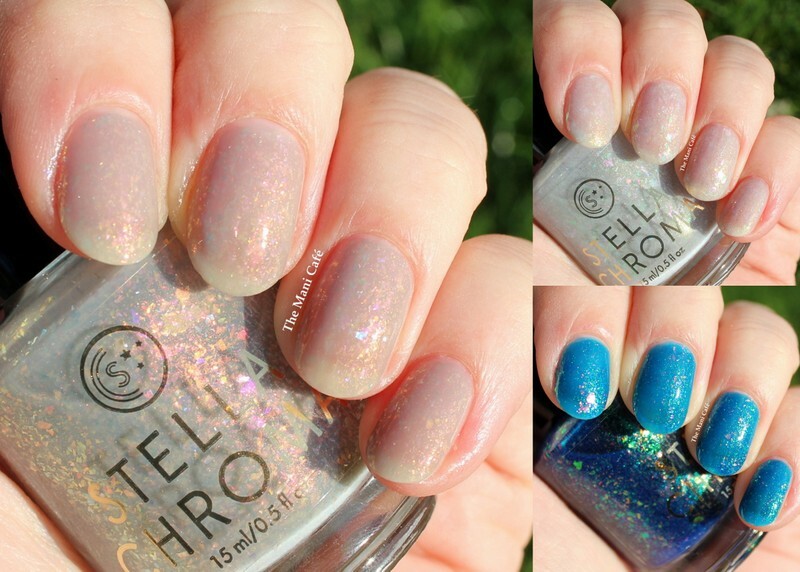 Each of these three polishes will retail for $12 and they will be available as a set for $33 until December 7th. The trio will be released on Black Friday (November 23rd) at noon EST. Concerning Black Friday and Holiday deals - STELLA CHROMA will be lowering the free domestic shipping threshold from $50 to $25 from Black Friday to Cyber Monday. No code required. There will also be a free upgrade to domestic priority shipping from December 14th-19th. December 19th is the last day to order with arrival by Christmas. As always, a portion of STELLA CHROMA proceeds are donated to charity. For the last quarter of 2018 the donation will be made to GirlStart, a non-profit based in Austin, Texas that has after school and day-long camps to help young girls develop a love for STEM (science, technology, engineering, and math).